The concept of sustainable building materials means different things to different people. For some, it may be about using products that are low-carbon, for instance, while for others the main driver in their selection might be concerns over health issues. Others will take an even wider view and avoid using anything that could cause pollution in its manufacture or disposal – or which uses scarce natural resources – and instead specify reclaimed, recycled, natural and renewable materials wherever possible. Deciding on exactly what to use when you’re building, finishing and furnishing a home can be a tricky and timeconsuming process; and it’s one that largely depends on your own priorities. So if sustainability is a key part of the decision, you need to think about what’s important to you about the environment we all share and try to reflect that in your choices. 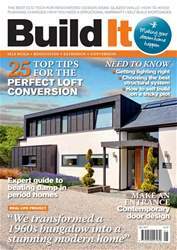 In this article, I’ll be explaining the key considerations that might help direct your specification. Your materials selections will be influenced, to some extent, by the position and geometry of the building. A steel frame may be required in parts of the scheme to provide sufficient structural support, for instance. Or you might be keen on a natural construction method such as straw bale (which is basically Lego for grown-ups) but find that a tight site rules it out due to the thick walls the system produces. Similarly, some options might dictate the use of only straight lines in your design, whereas others could be used to achieve curved features.